I wrote about receiving Bio-Life Astaxanthin Supplement for my review two weeks ago, and today I will be reviewing the effects of taking it after 14 days. Tomorrow, I will also be attending the Launch Event in 1 Utama, so do come and join me for a day of fun, you might also get to win the Astaxanthin product as well. The contest is so simple, just attend the event and take a picture (of me if you want!) and post on Bio-Life Facebook wall and you will get a free bottle for your own consumption worth RM100.70! So let me tell you a bit of history about my skin, as far as I had remember, I battled with skin issues. As soon as I hit puberty, I had terrible acne erupting all over my face and back. You could have called me volcano face back then. I thought it was a teenage phase as all my sisters had smooth face when they turned 20. Unfortunately not for me, I had breakouts and acne right into my 30s. To add salt to the wound, I had chicken pox at 33, some more while pregnant. Deep scars appeared all over my face to this day and they are hard to heal no matter what I use. I can only try to hide them with makeup. Therefore, I was really excited to try Astaxanthin 4mg when given this opportunity with the hope that it can help my skin heal and get better. It would be a dream come true to ever have smooth skin again (remembering back to when I was a baby). Especially now I am in my 30s, it is not just scars, pores and acne that I have to deal with, but wrinkles (make the horror face!) Lines started appearing on my forehead and eyes…I would try anything that can promise minimising these. So I started using Astaxanthin 2 weeks ago. It is only one pill a day after meal, so it is really easy to use and easy to remember. My review? Since I only used it for two weeks, I cannot assure you that all my skin issues are solved. However, personally here are the improvements I faced. 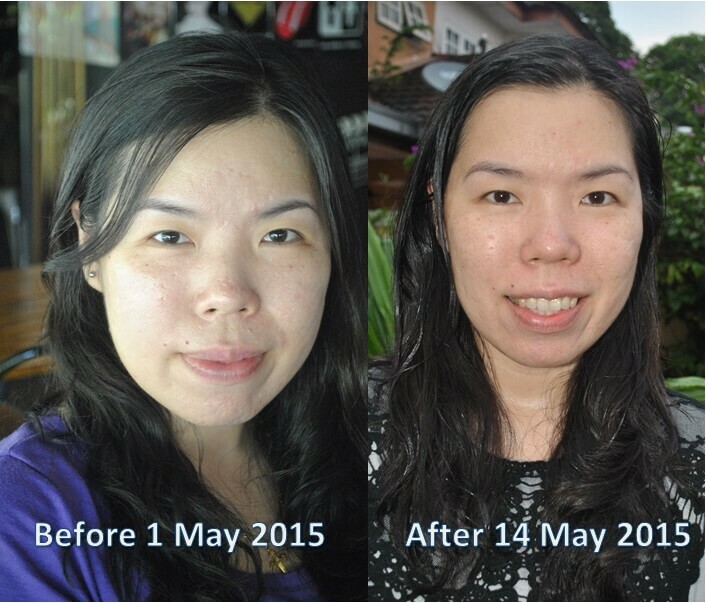 1) No new breakouts – It is normal for me to get breakouts monthly but these two weeks, I had not had any new ones. 2) Skin colour balanced – I used to never go out of the house without applying some coverage like BB or CC Cream but these two weeks, I went to work without anything but just Sunscreen. 5) Lips are not cracked and dry – I did not have to keep using lip balm over and over like before when my lips easily cracked in cold room. 6) Better sleep at night – I actually slept early these 2 weeks, before midnight, I used to not be able to sleep until about 1am! So basically, those are what I face and I really can’t wait to take Astaxanthin for at least 2 months on to see what greater effects it can bring. Stay tuned for further reviews. My first purchase had no fishy smell. Why the second bottle has strong fishy on the taste? I suspected they must have added in krill fish oil instead of the algae.This is very unethical of the company to profit on their customer in this way. I will stop buying any product from Biolife. Thats it.